“Traditionally museums have been defined by what they collect. The generosity of collectors, artists, and friends through the years has endowed the Queens Museum of Art with art work of both contemporary and historical significance that have reshaped our collection. What was once a collection known primarily for the ever-popular Panorama of the City of New York and artifacts from the two New York World’s Fairs is now, thanks to recent acquisitions, a vibrant body of work that corresponds to the Museum’s focus on our community, the borough of Queens, and the world beyond. The fresh additions to the QMA vary in medium, style, and the artists’ biographies. Collectively, however, the works delineate a series of terrains with specific references to states of cultural fusion, legacies of city planning, and stories of immigration. What emerges is a portrait of people, communities, and cultures defined by the spaces and places they engage. For the 2001 exhibition Crossing the Line, over fifty emerging and established artists created site-specific works in and around the museum and the neighboring communities of Queens to foster awareness and understanding of art’s place within the borough. Mark Dion’s project for the exhibition The Great Ash Dump Dig (Flushing Meadows) enlisted an army of volunteers to excavate a section of QMA’s parking lot, revealing the historical diversity of the site through the discovery of archeological artifacts. Using scientific methods of collecting, ordering, and exhibiting objects, Dion’s work often illustrates how scientific systems contribute to the ways we both understand and misunderstand natural world. Jean Barberis and Alexis Lautier’s Le Tour de Q.M.A. (2002) is one of many adventurous (if still plenty artistic) productions accomplished during the exhibition Queens International 2002 in which the local artists collaborative Flux Factory participated in a residency style. They came up with the idea of touring the Museum in a highly idiosyncratic manner – at top speed on one’s stomach. The stop animation video captures two men traveling through the museum on their belly. While each frame is sharply focused with a digital camera, the cranky stop-motion creates a good old-fashioned cinematic illusion that makes improbable acts and motions believable. Watch them dash and slither through the galleries, café, offices and backdoors of the Museum! In the Spring of 2007, the Queens Museum of Art held an exhibition on the legacy of Robert Moses in collaboration with the Museum of the City of New York and the Miriam and Ira D. Wallach Art Gallery at Columbia University. 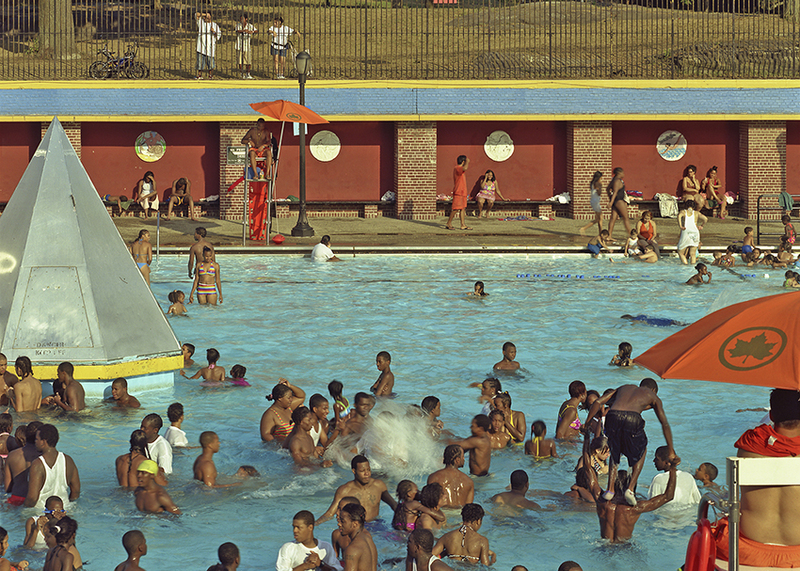 Hillary Ballon, architectural historian and curator of Robert Moses and the Modern City, commissioned Andrew Moore, known for his richly colored, large-scale images of architectural and urban scenes, to document the sites built by Moses. For two years, he prowled the city’s five boroughs, capturing the unique character of the beaches, bridges and byways that Moses had so radically transformed. His photographs anchored Moses’s influence to the present and became the visual preface for the book accompanying the exhibition, Robert Moses and the Modern City: The Transformation of New York. Shifting our eye closer from the sites in Mose’s expansive project, Jeff Chein-Hsing Liao’s award-winning photographic series Habitat 7 captures essence of Queens life sprawls along the #7 train, the Flushing IRT, a.k.a. “The International Express.” Like river valleys that flowed through and gave birth to early civilizations, the 7 train of the New York City Subway system is a major artery of economic and cultural exchange that links together ethnically diverse neighborhoods from northwest Queens to the heart of Manhattan. As the “”habitat”” for many new New Yorkers, the 7 train is a metaphor for the delicate balance between the pursuit of the “”American dream”” and the preservation of ethnic traditions. Liao’s Habitat 7 depicts the complex communities formed in the shadow of the International Express. Shot with a large format camera, these large-scale photographs compile multiple exposures taken over the course of several hours at the same location, allowing for intimate detail as well as panoramic views. First featured in the Generation 1.5 exhibition in 2007, Seher Shah’s artwork originates in her unique bi-cultural balance. Born in Pakistan and lived in Western European regions before moving to New York in her teens, Shah creates geometric spaces in deep perspective where Islamic calligraphy and iconography explode into landscapes of decorative pattern. Drawn from both current events and her personal history, Shah’s symbolic world hovers between Eastern and Western, devotion and violence. Applying a flat graphic style to charged images like Mecca’s Kaaba, Shah invites ambiguity into the over-determined meanings we apply to potent religious and political symbols. While the Mexican economy has quietly become dependent on the money sent from workers in the US, the US economy has also grown dependent on the inexpensive labor provided by immigrants. Dulce Pinzón’s The Real Story of the Superheroes (2005/7) pays homage to New York’s Mexican immigrant workers who bravely commit themselves to work long hours at low wages in order to support the communities and families they have left behind. In the shadows of the Gotham city, they are the everyday heroes who endure, without the help of supernatural powers, the often severe conditions of life in the U.S.
Born in Germany in 1830, Albert Bierstadt immigrated with his parents to Massachusetts in 1831. After attending the Dusseldorf Akademie, Bierstadt soon returned to the US and joined the ranks of the Hudson River School. Lured by the splendor of the Rocky Mountains and Yosemite, he accompanied several westward expeditions, returning to his New York studio with sketches that he transformed into dramatic, vibrant paintings. A departure from his epic landscape paintings, the drawings presented here capture the more intimate landscapes of the Western Smoky Mountains and his native Germany. While these acquisitions are a reflection of the Museum’s recent exhibition history, The Gift 2008 also marks an important first step in the Museum’s future. Ernest Concepcion’s site-specific murals found throughout the galleries are the first iteration of Launch Pad, a new QMA series of artist projects that engages artists through their socially collaborative practices. Entitled Queens 20/20 Concepcion’s wall-drawings spontaneously respond to the works on display by mixing up optimistic and apocalyptic analysis and extensions of their visions. Being constantly developed during the exhibition’s entire duration, Concepcion’s guerrilla-style wall drawing amplifies the viewing experience and carries the recent past into the continuous future.